Was a good app but it will no longer sync and support does not reply. While the functionality of this app was great, the stability was terrible. The only work around was to delete the app, reinstall it and then re-sync the database. Now it appears to be impossible to sign in to re-sync, making the app useless. Emails to support have gone unanswered. Been using for years, loved the product but it recently crashed and I tried contacting them, never got a response. I have 4 years of info on the app and now I can’t access it. Not a good idea if you want something relatively simple, as it keeps inexplicably adding items to my list even though I have no minimum quantities set. The real deal breaker though is that it makes you enter everything in whole quantities - 1 box of sugar is very different than a tablespoon in a box! But there is no customization of units and only whole numbers allowed. Otherwise it wasn't bad. I paid for this app because I needed my database to sync across devices. Unfortunately, the developer seems perfectly happy to continue taking people's money and offering no support even though a major function of the app is broken. It's a nice app, but I wish they had not changed the screen colors for adding and removing items. It used to be green and red, but now it's green and blue/green. Seems minor, but if you use the app a lot, it gets annoying to constantly have to double-check what you're doing. This used to be a great app. But they changed they changed the password requirements locking me out of my own group. Before my password was made up of alphas and symbols. Now they no longer use symbols and i need to use numbers. I emailed support and even tried to create a new group. But it's not letting me because my password is incorrect. But I can't reset my password until I get a response from support. I used to love this app. Now it's rubbish!!! The best inventory manager I could find! 5-Stars for being a great inventory app. It has a feature-rich interface yet isn't over-complicated. Plus the GUI looks great. It has the ability to manage your groceries and household goods, along with just about anything else you want to keep track of. And it supports syncing between devices, so my wife and I always have the inventory on hand on our iPhones and iPads. 4-Stars for the room for improvement. I feel that sometimes the act of adding new items to the inventory could be a little simpler. There's lots of scrolling, tapping and typing involved. Something like a new item "wizard" would be welcome. And I've accidentally "scanned out" an item I've used up only to realize I forgot to tap the "+" button to actually remove 1 quantity of that item from my inventory. My one biggest wish for the app is a way to manage partial use of an item. There is a field for servings per container, but I don't see a way to show how many have been used. So I can't figure out how to indicate I've consumed 4 granola bars from a box of 12. Handy when you are in the grocery store and you want to know if you need more... Do I have a full box, or am I about to eat my last one and need more? Overall, a great app. I'd give it a 4.5-Star rating if I could, but since the developer has been in touch and working to improve the app, it gets that little bit extra! Best Inventory App EV-VER!!! Period. This app is awesome!!! If you actually use it, it will save you time and money. I never have to worry about going to the grocery store and forgetting to pick something up (which saves time by sparing me from having to go back for a second trip later on). I never have to worry about purchasing items I already have in stock, but forgot or didn't realize I even had (saving me money by sparing me from purchasing the same thing twice). It also saves me money by letting me know with the click of a single button, when foods I have are about to expire - so I can make a concerted effort to ensure they're consumed prior to their expiration date, after which I would have had to throw them out. The only downside to this app at all is that in order for you to benefit in the same ways I do, to the extent that I do, you have to stay committed to tracking your inventory - if you buy something and don't scan it, then forget you bought it, you're liable to accidentally purchasing it again - so you need to stay committed to using this. But if you do, it is impossible not to save time and money. Yes Yes! It works as it should. So happy. This is the Best Pantry App out there. Best feature- The iGroup feature. I have tons of different brands of the same product. You can group the brands so when you search for a product all brands show up. No other App has this. 99% of UPC product look up works. I did a little research before selecting this product for my pantry inventory. From the beginning I really loved using it. It's easy and fun to scan in the products, and the database is very comprehensive. It's easy to see my foods that are about to expire so that I can incorporate them into my meal planning. My pantry is way more organized than it has ever been. After a while I encountered an app issue which I reported. Customer support was quickly on top of it. Even though I seem to be the only person having a problem, they took me seriously and worked on the issue diligently until resolution. Very rare and refreshing for iPhone app support! 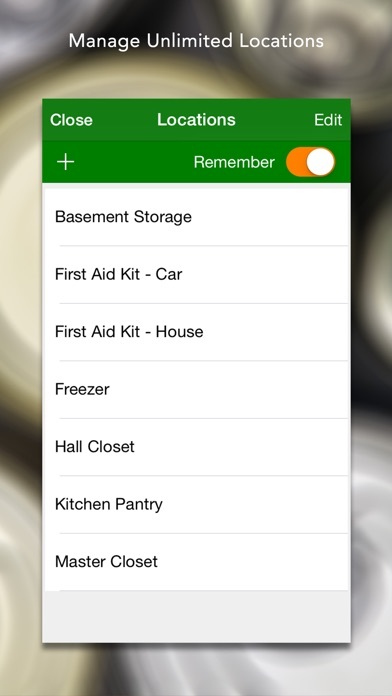 Great app to help keep track of your prepping supplies, from food to first aid kits. Definitely recommend! Really love your dedication to keeping updated in tune with new Apple devices. Really professionalism. Thumbs and toes up. This app used to be great. I used it for several years with success. With the latest update several months ago, it won't stay open for more than a few seconds, rendering it worthless. I have repeatedly tried to contact customer service with no response. If I could give it zero stars I would. Don't waste your time or money. Update 5-30-16 - support no longer responds, get error message that server isn't connected. Unusable because server is needed to scan in items that need to search for the barcode name. Good software, love that I'm able to scan in and out of inventory, love that it automatically creates a grocery list and can e-mail it to myself. I do wish that when I save the csv file to my computer thru itunes that it would include the tag associated with the inventoried item or even if the cart would let me sort the items by tag and then e-mail it to myself would be great. It would help me sort the list so I could be more organized when I get to the grocery store. Overall very happy with this purchase, have had no problems with the app. Thanks! I was frustrated by the limitations of grocery lists. Each item has to be added, then crossed off. If I'm standing in the soup aisle, for example, and I wonder whether or not we're out of pea soup, a shopping list may not tell me. But this app lets me inventory my food, and out of the dozens of foods I've entered via bar code, there were only two or three that weren't in the database. I'm able to know what I've got, the size of the package, number of servings, and expiration date. I can quickly set a minimum number of some item that I want to have on hand, and have the item appear on my shopping list when we have less than that amount. This app is exactly what I've been looking for. The only thing I'd like to be able to do that I don't think I currently can is to have a way to add new items for which I don't have, or haven't chosen, a particular brand or package. Otherwise, a great app. Scan two items and then it force closes after every save. I love the app but that makes it horrible. It appears the developer has abandoned this app. Which is a shame as there was good potential with it. I had looked at dozens of other Apps and this one seemed to be the most useful of the bunch. App will not even allow me to sync. It tells me it can not connect to the server. Waste of money. Works great. I am glad I purchased. 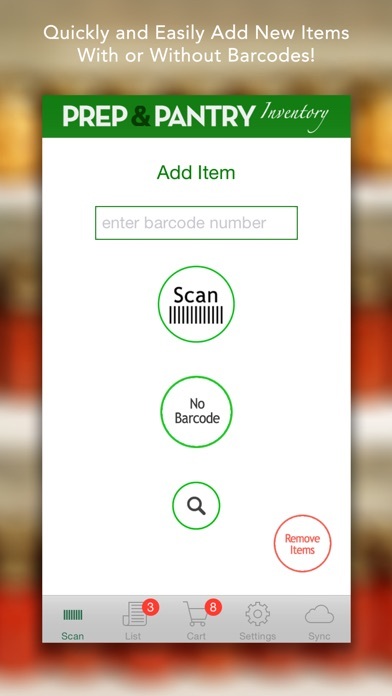 This is the BEST pantry/kitchen inventory app anywhere! I have tried them all, both free and paid. Does everything I want and does everything it says in the description. Great App! Deserves 10 stars! This app is why you never depend on electronic anything. I'm going back to a paper inventory method. What a disappointment. It crashes within seconds of opening. Good revamp - if only the input field for item description is not buggy! I really liked the update...until I started to edit the item description. The editing function in that field is completely messed up. I could not edit the item name correctly. 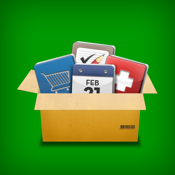 This is a great app for inventory and organizing. I use this for my business and it saves me a lot of headaches when it comes to my stock being out of date. With that said, the app had not worked in over 3 weeks! It crashes upon opening. This is extremely frustrating when your job relies on you being able to rotate stock before it goes out of date. I have emailed the company numerous times to get answers and no one has yet to return 1 of them. It is a shame because I have tried almost all the inventory apps out there and this is the best, when it works. I have experienced the same email issues others have reported. I emailed support because I wanted to use decimals instead of whole numbers when doing my inventory or setting minimums to indicate replacement. Some items don't need replacement until I've used more than half the container, so whole numbers don't help. I would have given 4 stars, but the email issues are really annoying and disappointing, so 2 stars. Don't buy this!! App is broke! This app has been broken for several months! You can still add items to the inventory however, you can't see the items in the cart . Also, you cannot export the inventory because that is also broken! I have the same problem as the previous reviewer. I have just spent the past FOUR DAYS updating my pantry. Now, every time I try to access the app, it blinks out and crashes. Otherwise, i love it. Please fix ASAP,!!!!! I'm so excited about the item groups!! (So much so that this is the first app I've ever reviewed.) I'm a sale shopper with few items for which I am brand loyal. I've already found the app very helpful and am looking forward to being able to take full advantage of the quantity minimum feature. No more running out of pizza, soup and other items with many brands/varieties!! I only gave 4 stars because no app is perfect. There are few and minor negatives and they are far outweighed by the increased functionality of this update. Such a fantastic app for years. Now, no support. Sad. Works exactly as I expected. GREAT customer support. The e-mail address no longer works. I was wanting support because I could not create a group. When I try to create a group, I get a message that it could not reach the servers. So now I am stuck with an 8 dollar app that seems to have no support and so servers. UPDATE June 2018 It’s two years now and still waiting on bug fixes. But wait! There’s a new development!! Two important functions have stopped working. Waiting 3 weeks now for Tech Support answer: * Cannot retrieve product descriptions from foods database. * Cannot sync. When trying to sync, program asks me to Join or Start a sync group. Can’t join one cuz password to my data is lost and there is no way in the app to retrieve it or change it. Fortunately I was able to export a CSV file with my stuff, but that means re-entering all my inventory to a new app BY HAND. The symptoms suggest that certainly the app, and possibly its creator have been found dead beside the road (euphemistically, of course). For now, P&P is dead to me. I guess for a couple of bucks, what can you expect? 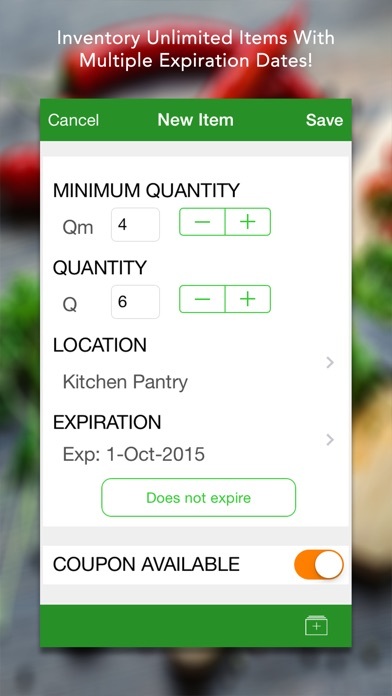 I paid the fee for the Home Food Storage app by Long Term Glass Wares LLC so I could evaluate it. It compares favorably to P&P (when it works) but I’m not sold on it yet. I’d like to see more product reviews from those who have used P&P, sharing their experience, but also may have first-hand knowledge of other solutions. One good point in Long Term Glass Ware’s favor is that they have good app doc on their website. It’s a little thin, but accurate. Perhaps they will continue to improve it. Original post follows (Fall, 2017) .............. There are still a number of bugs in this version. 1. Changing item and group names is convoluted at best 2. No documentation of how to use the shopping cart. Can't remove things from the cart, so it gets bigger and bigger. 3. Move function has been in Beta for at least a year. 4. Adding items from Item Detail using the folder icon does not always work. 5. Zero and Expired Items report is useless. It should be a CSV so it can be manipulated. 6. Save Only option does not provide a way to access a report since iTunes app does not exist on iPhone or iPad (like it does on PC or Mac). 7. There are more, except they don't easily come to my mind. This product is now NOT worth the $7.99 price. I couldn't get a group setup due to server issues on the vendor's side, tried to reach support many times many ways with no success...ended up requesting a refund and dumping the very expensive app. Disappointing - had high hopes. This used to be a great app and I recommended it to everyone. For the last few months the data base didn’t work. iOS 12 logged me out and now- everything is gone! No response from support, either. I’m too busy to try to make this one work, thanks to another reviewer I’m off to find a new app. Boo!! Cannot sync or create groups. Would be a wonderful app if it worked like it is supposed to... Until it is fixed this app stole my money. At first it works ok, then when I input all my foods at my pantry it crash a lot . I canot even use it now, every time I open the app it crash and won't open at all. Waste of time using this app. I think the issues are fixed. I haven't used this app in over a year and when I logged back on it said that the old server was not working so it's now running on a new server. So far everything seems to be working fine. It would be great to have an additional field created to help organize items by type. For example, if we purchase Hunt's ketchup and Heinz Ketchup, it would be nice to be able to group them simply as ketchup, rather than individual items (we are not brand loyal on some items). Can't seem to get rid of the notification. Very annoying. 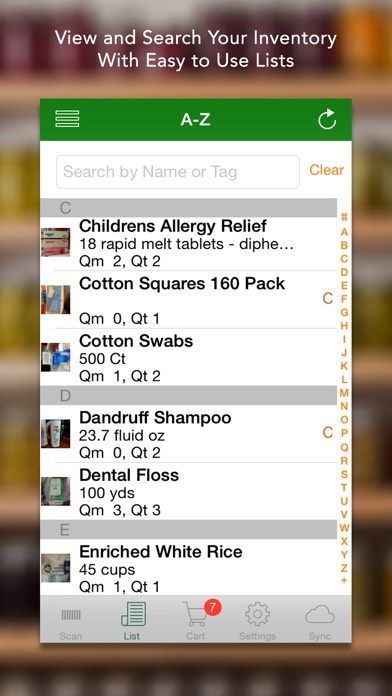 I've been waiting for an update for Pantry in hopes that I might sync up all the info I'd put on my iPad version with my phone, and so use it while shopping--what did I need to restock the pantry. I was delighted to find that I could finally create a sync on my phone. Unfortunately, the update causes the app on my iPad to crash. Every time I try to open it, it vanishes. Frustrating to say the least, because NOW I can't sync the phone/pad AND I can't get all at all the info I put on the pad. I sure hope this gets fixed fast. I so wanted a good pantry organizing app, and I thought this was the one. It could be so good if they'd just get past these issues. I finally got a chance to inventory all of the food in my home. This app does have a few faults though. The app basically is a combination of a few lists, which is fine for an inventory but it really needs a workflow to make it worth the cost. For example, when you take the time to make a shopping list, then carefully check off each item while shopping, it would be excellent if it walked you through your shopping list when you get home so you can scan everything in. Also it would be great if the naming conventions used were clear and consistent for the database. It isn't clear where to track brand name and tracking units of measure is not clear either. Inventory software is one of the oldest types of software out there. The developers of this app could have used a little bit more of the common inventory design conventions to make this an easy to use app.. If this were a free app I'd give it 3 stars. But since I had to shell out $8 for software that can't track food as well as a free calorie counting app, this gets one star from me. Last update was for iOS 7. Another app abandoned by the developer that Apple allows to stay in the store to part people from their money. This used to be a great app, but hasn’t been for over a year now. The original developer (Doug) was fantastic, but the time investment was too much and he sold it to Patrick Media. After that, there have been no updates or fixes (Doug did do a couple fixes post-sale, as well as rectify the database debacle that occurred soon after the sale as well). The bugs (as stated in other reviews) are numerous, and crashes frequent. One annoying one is that on the iPhone version, a non-inventory item can’t be added to the cart. After typing the first letter, the keyboard disappears. Fortunately, my wife has the Android version which doesn’t have that particular flaw. I continue to use it because my inventory is huge and I’ve learned how to work around the bugs, but all it would take is another DB crash (somewhere in the cloud) and all would be lost. Not confident that Patrick Media, based on past performance (no answer to support requests, no updates whatsoever, etc. ), would be able/want to recover. Don’t waste your money.